Graco proximity switches from MotionSource are magnetically-operated sensing devices for sending system data to the controller or PLC. With pressure ratings up to 10,000 psi (690 bar), these proximity switches are available in 115 VAC or 12-32 VDC. Graco proximity switches are available for all series progressive families to provide cycle rates up to 200 CPM. The single control PNP proximity switches are used to detect lubrication cycles on your equipment. Graco offers three types of proximity switches for use on series progressive divider valves: Reed-Type (Reed) Proximity Switch, Field Sensing Magnetic (FSM) Proximity Switch, and Field Sensing Mechanical (FSmech) Proximity Switch. All are magnetically operated, single-throw switches that sense the movement of the divider valve’s piston when it is cycling. • The Reed-Type proximity switch is available as an unattached version (magnetically attached to piston) for oil-only applications using MSP, MH or MGO divider valve assemblies. • The Field-Sensitive Magnetic proximity switch is a dry contact, ceramic magnet operated switch. It can be used in either grease or oil applications and is available in three sizes compatible with MSP, MH, MX/MXP, and MGO assemblies and its use is not limited by valve section size. 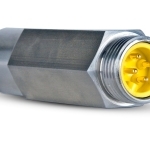 This switch is also available in an explosion-proof design with a six-foot long cable for use in MS/MH divider valves. • The FSmech proximity switch is designed to provide a greater reliability of operation when used with the very low signal power conditions common to DC-powered PLC’s. It is a magnetically activated proximity switch that contains a miniature snap-action switch, activated by the attraction of its internal magnet to the divider valve’s moving piston. The 24-volt DC-only version of this switch is available with integral light-emitting diodes (LED) for local verification of power and cycling activity. Similar designs without LED’s are suitable for either AC or DC power operation; there is also an explosion-proof version with six-foot-long pigtail leads. FSmech proximity switches are available for MSP, MH, and MX/MXP divider valve assemblies. Not sure of what you need? Our years of engineering innovative automated lubrication systems, plus regularly being named a Graco Platinum and Gold Partner means that the components you need are in stock right now. Order today, Ship Today. Call us 888-963-6686 or email us at Engineering@MotionSource1.com to speak with one of our industry experts. With hundreds of thousands of parts in stock, we have what you need, when you need it! This inventory of proven components allows our engineers to design a truly customized system using economical on-the-shelf parts. Looking for technical data? Product manuals? Our expert technicians are available to help. When you’re working with MotionSource, you’re working with “The Source”. Give us a call today.